N. Amer. Sp. of Lactarius, p. 369. 1979. Cap 9-21 cm broad, convex-depressed, the margin incurved, often wavy; surface viscid when moist, smooth, obscurely zonate, buff-brown, light grey-brown, sometimes spotted or mottled darker brown, at times tinged lilac, typically lighter at maturity; flesh thick, pallid to cream, unchanging; odor indistinct; taste mildly peppery. 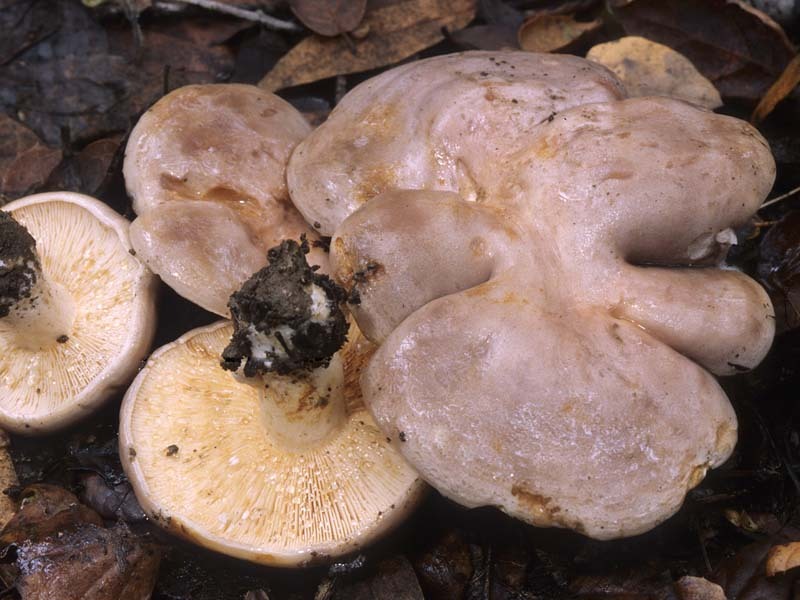 Gills subdecurrent, moderately broad, close to crowded, cream becoming dingy-buff in age; latex white unchanging but discoloring gill tissue grey-brown. Stipe 7-14 cm tall, 2-5 cm thick, stout, stuffed, more or less equal; surface subviscid to dry, cream, irregularly pale-buff in age; flesh white unchanging; veil absent. Spores 7-9 µm, round to subglobose with partially reticulate amyloid ornamentation; spore print cream-yellow. Solitary to scattered under oaks, especially coast live oak (Quercus agrifolia); fruiting from mid to late winter. 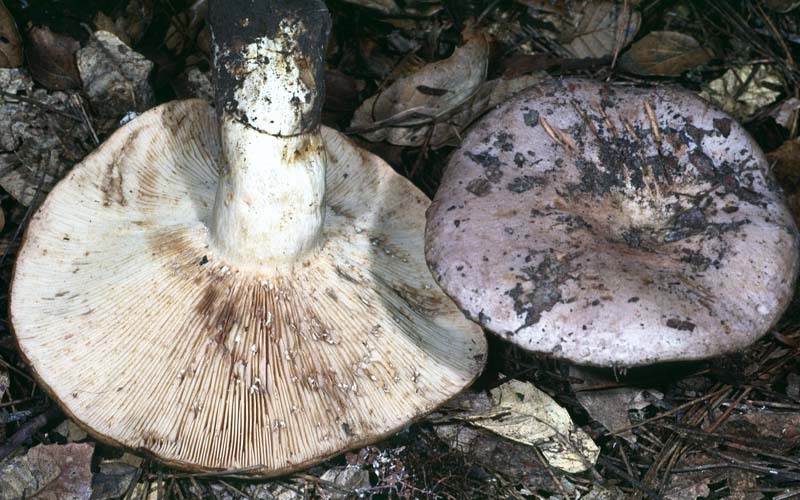 Large size and drab coloration characterize Lactarius argillaceifolius var. megacarpus. Lactarius pallescens is similar though usually paler colored, smaller, with a latex that stains gill tissue lilac, not grey-brown. The largest of our local milky caps, Lactarius argillaceifolius var. megacarpus can be common in some years and rare in others. Methven, A.S. (1997). The Agaricales (Gilled Fungi) of California. 10. 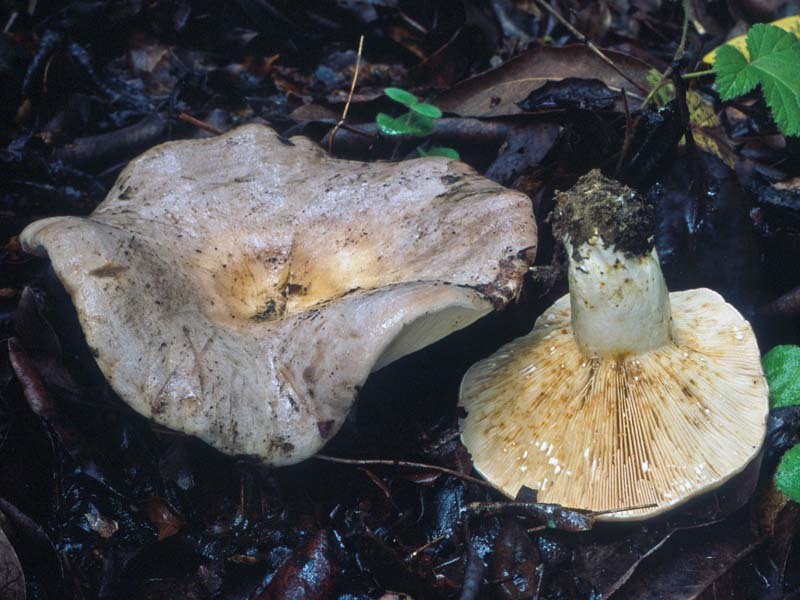 Russulaceae II. Lactarius. Mad River Press: Eureka, CA. 79 p.